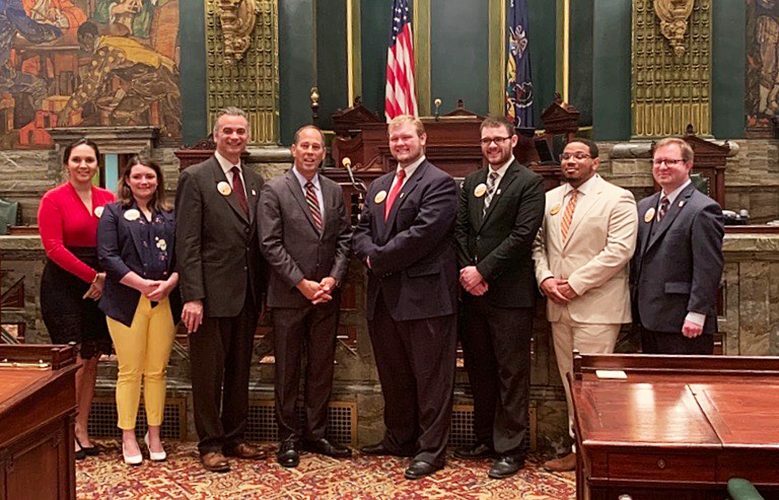 Shown, from left, are Dr. Stephen Neun, dean; students Jonathan Buythenhuys and James Russell; Robert Pignatello, Lock Haven University president; and Dr. Gerard Martorell at the recent eighth annual Pennsylvania State System of Higher Education (PASSHE) Student Business Plan Competition in Harrisburg. Russell, a business management major and exchange student from Glasgow, Scotland, submitted his business plan for his company, GreenBean Energy, and was selected as one of 10 finalists competing for the $10,000 top prize. GreenBean Energy takes residue from used coffee beans and recycles it to create the “coffee log” – an environmentally friendly alternative fuel source to traditional firewood. In addition to the business plan awards, prizes were presented for the best poster displays. The 10 finalists and seven additional semi-finalists were invited to design posters and display them during the reception preceding the awards ceremony in Harrisburg. Russell’s poster on GreenBean Energy won second place. Attendees ranked their top three preferred posters using SurveyMonkey. A total of 53 attendees voted, and Russell received the second largest number of points based on rankings and will receive a $150 cash prize. Buythenhuys and Madeline Berger also were part of the student group that presented GreenBean Energy at LHU’s Student Pitch Competition in November. At left, a hand drawn diagram is shown with information about the product.